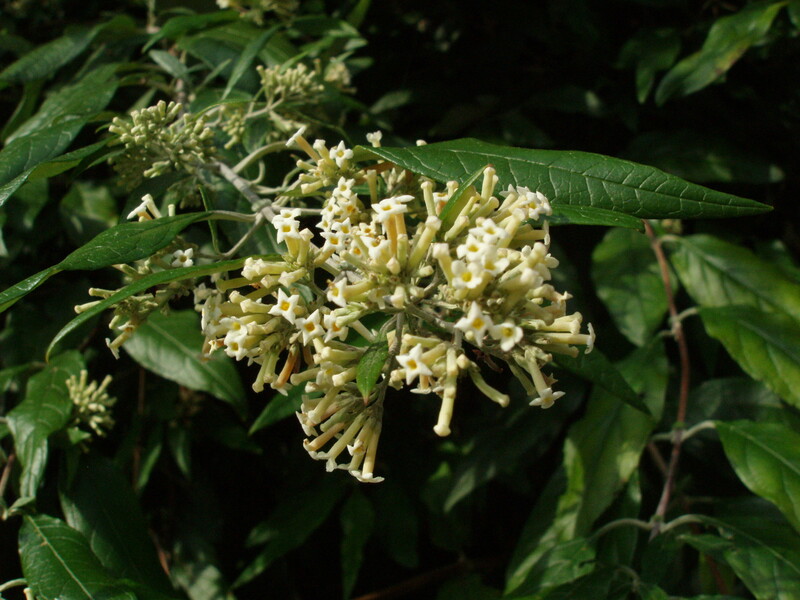 Buddleja auriculata is a lax growing shrub with branches which arch to the ground in places. 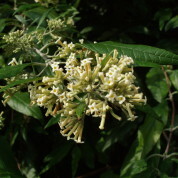 The small cream flowers are borne on the previous year’s wood in late autumn or winter. Plants need protection from frost, best grown on a south facing wall. Plants outside will be root hardy however all top growth will die and resprout in spring. For a number of years there was an impressive specimen growing on the back wall of the herbaceous border at Longstock Park and at the National Trust’s Hinton Ampner in Hampshire. Collected in 1813 by English explorer William John Burchell, named and described by George Bentham in 1836. B. auriculata is widespread throughout South Africa, Zimbabwe and Mozambique where it prefers rocky ravines on mountain slopes or the edges of high elevation evergreen forests.